American Animals (2018), (♦♦♦♦): On the final day of the semester in 2004, four college friends carried out an art heist in the rare collections room of Transylvania University’s library with the intention of acquiring rare first edition books, some of which dated back to the 19th century. Their primary target was Audubon’s books of animal paintings, estimated at 12 million dollars. The perpetrators planned their crime by watching heist films and googling instructions on how to rob a place. After aborting the heist on the first run due to unforeseen circumstances, they went ahead with it the next day. It did not go smoothly. I have seen a fair share of capers movies. It is, after all, one of my favorite genres. Heist films tend to oscillate between two themes: the ones that are successful—think the Danny Ocean trilogy (See Ocean’s Eleven (2001)), The Thomas Crown Affair (1999), Flawless, The Italian Job (2003), and Thin Ice—, and the ones that go mightily bad—think Takers, Drive, The Town, Before the Devil Knows You’re Dead, and The Place Beyond the Pines. I like both types; the successful ones for the adrenaline rush of an elegant job executed flawlessly, and the heists that go bad, for the drama and the high stakes game. 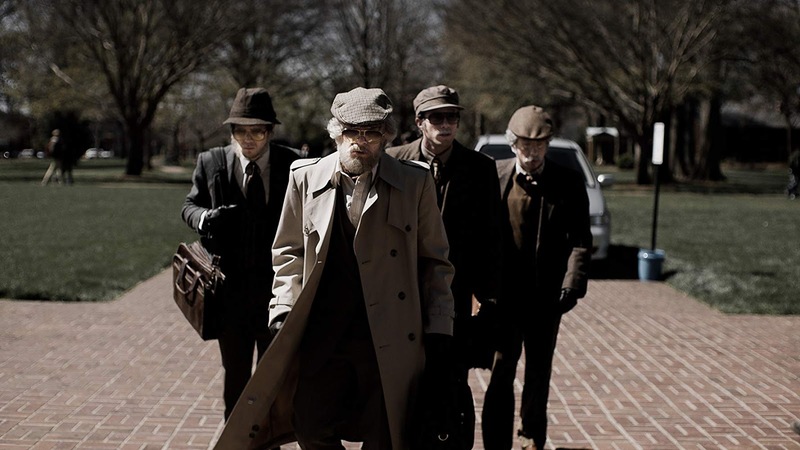 American Animals is a solid entry in the genre with a unique take and the added bonus of perspective. 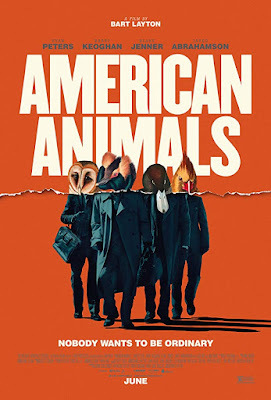 Using frequent close-up camera shots of beautiful animal paintings and actors applying makeup, American Animals works both as a solid heist movie and the documentary it aspires to be. It is not based on a true story; it is a true story that unfolds through an eclectic mix of past events—images reconstructed with actors playing the parts at the beat of dizzying tunes during their wildest times (i.e., partying and committing petty thievery), with atmospheric, tension-filled music to underscore the heist and its aftermath—and modern-day interviews with the actual players narrating the events as they unfolded, take by take. The audience takes front seat to witness what I have come to label “the elasticity of memories”. Every player involved remembering things differently, sometimes vastly so, thus one is not sure of how things actually happened or if every man involved viewed things through others’ lens. Also, through this rather innovative storytelling the audience gains perspective because we get to witness, for the first time, people who were involved in movie-like events and wish they have acted differently. They are not proud of the damage they caused. 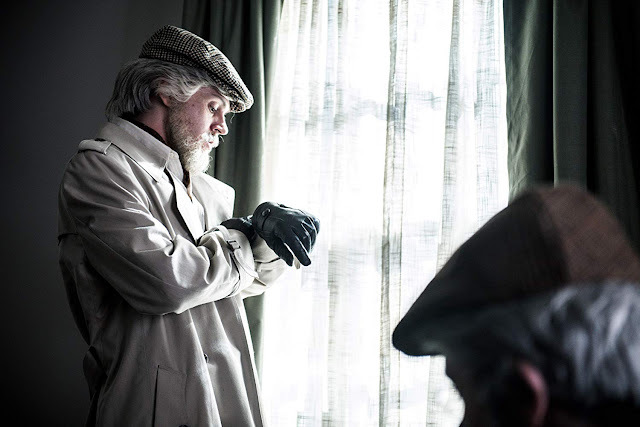 Nuancedly acted by the ensemble cast, including the real-life subjects providing their innermost doubts and regrets, makes this caper compelling, refreshing, and a movie event that should not be missed. 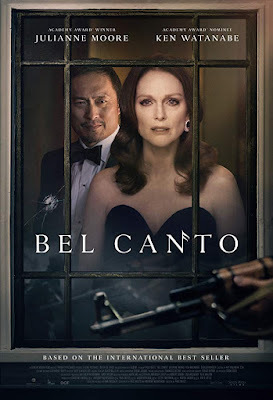 Bel Canto (2018), (♦♦♦): The President of a South American country has excused himself, at the last minute, from attending a birthday bash thrown by his Vice President for the head of a Japanese corporation who has the intention of investing in their country. People of different nationalities are in attendance. The highlight of the celebration is the singing by a world-famous soprano. When she finishes one of her arias, guerrilla fighters enter through the air conditioning vents and take everyone hostage. In the standoff that ensues, bonds are forged between hostages and captors. 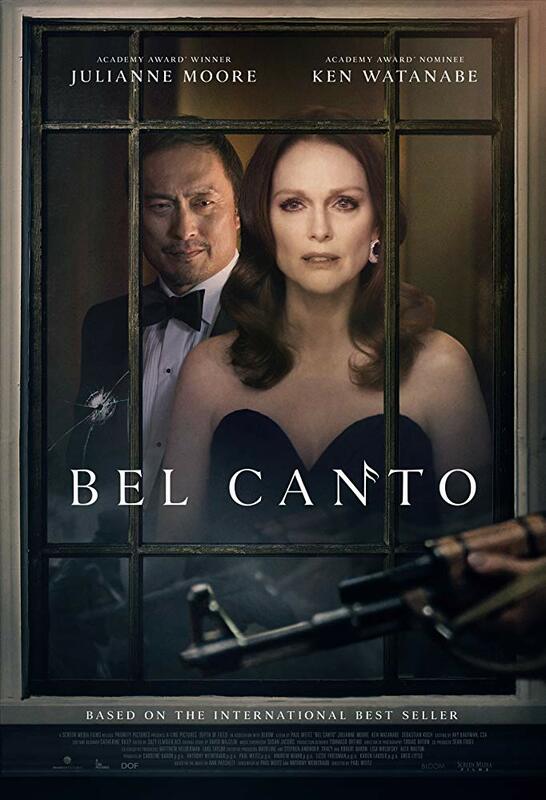 Partly produced by Ann Patchett and Paul Weitz—the latter also directed—, Bel Canto is an adaptation of Ann Patchett’s bestselling novel of the same title (book review), which has a running time of 100 minutes, starring Julianne Moore (Roxanne Coss), Ken Watanabe (Mr. Hosokawa), Ryo Kase (Gen), Sebastian Koch (Messner), and Christopher Lambert. One of the strengths of Bel Canto lies in its star-studded international cast—some of the best actors in the business whose talents are criminally underused in this overly saccharine production. There are two more good things working in favor of this movie: it is visually appealing, not emotionally engaging or remarkable by any means, but it conveys the message prettily; it also helps that it is a very faithful adaption, something that no doubt will appeal to fans of the novel. However, the inherently problematic “sweet” source material, is magnified a hundred-fold in the movie. The characters’ inner worlds are left unexplored, words devoid of feelings control the narrative, thus it becomes hard to believe that those hostages are scarred by their traumatic circumstance, or that their captors haven’t even thought about the fate that may befall them all. Bel Canto will not be wasted time for fans of the novel, but I recommend you rent it if you are intent on watching it. 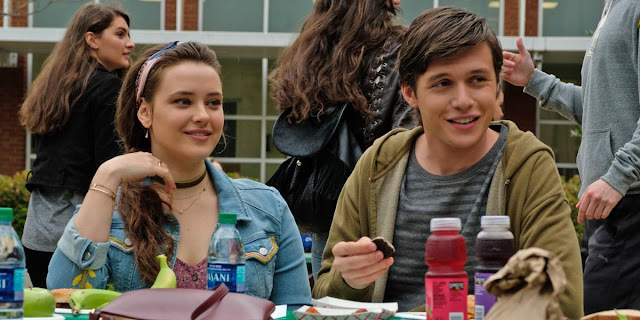 Love, Simon (2018), (♦♦♦♦): Simon Spier is a typical teenager: he has a loving family and circle of friends, two of whom he knows since kindergarten. He has a sister he loves, who aspires to be a chef, and whom Simon supports by trying out her experimental dishes. However, Simon has a secret...He is a closeted gay. Classmate Martin accidentally accesses Simon’s email account and takes screenshots of his email exchanges with a boy from the school. Martin could not care less about Simon. He is rather besotted with Abby, one of Simon’s closest friends. Thus, the deal is on: Martin’s silence in exchange for him getting close to Abby. However, Simon’s life is about to get infinitely more complicated when he discourages his friend Nick from pursuing Abby, and Martin declares his love for Abby in front of the whole audience right before the start of the homecoming football game. 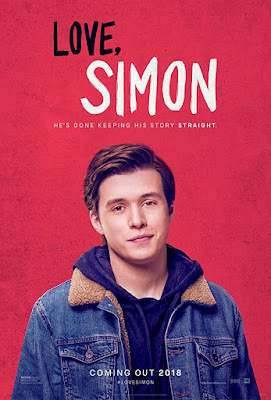 Based on the novel Simon Vs the Homo Sapiens Agenda, Love, Simon is a lovely movie with lots of high school drama, hip music, some (at times unintended) humor, lots of heart, and a not so subtle message about acceptance that is by no means preachy. It is a coming out tale but also a come-of-age one, with hip music, endearing characters whose fates we care about, and the mystery of what will happen to Simon and the identity of his boy crush meaningfully explored as well. We even care enough about the villain to feel bad for him. Give this movie a chance even if you think you have nothing in common with the characters. You will be entertained and delighted. "Googling instructions on how to rob a place"? Apparently Google really does know everything! I think I'll give Bel Canto a miss. I prefer to keep my images of the novel which I loved intact. Love, Simon does indeed sound like a lovely film with a lot to recommend it. I know, right? :-) I assure you Bel Canto is not bad, is just not remarkable either. ;-) Love, Simon has a lot going for it. Both I and my husband like the heist movie genre. I hadn't realized that American Animals was such a mashup of a docudrama but it sounds worth watching. I appreciate your balanced review of Bel Canto. Well, American Animals is a docudrama probably in the same way I, Tonya was a docudrama, the format is approximate, except that in AA the actual robbers give their input in interview style. It works very well, to be honest. I think I want to give Bel Canto a shot. I started the novel but did not finish it -- sometime I might go back to it. The movie looks visually enticing as you said. & Watanabe & Moore might make it interesting enough. But it's too bad it wasn't a bit better per your review. Other hostage kinds of movies have been a good formula. Thx. We are trying the BBC drama Archangel with Daniel Craig at the moment. Several years old I think. Hostage movies work well when they are thrillers; Bel Canto is more melodrama than anything. Watanabe and Moore make it interesting, but the movie is just too sweet to my liking, not enough depth. I own Archangel; it's quite good. In my opinion, Daniel Craig is better as Bond, but he is watchable as a historian out of his depth. I've not seen the first two but I loved Love, Simon. It was very entertaining and a little bit like one of those films where you have to cover your eyes because you know everything is going to go pear shaped.